Ewen and Maria’s son John Cameron did not travel on the Blenheim – he married Catherine Black in 1840. The Old Parish Register for Kilmallie (Argyll) for 1820 records that John Cameron, son of Ewen Cameron at Gearidh and Maria Colquhoun his spouse was born 4th and baptized 9th April. John Cameron died on 16 December 1872 at Bailevolan, Lismore. The registration in the parish of Lismore in the county of Argyll noted that he was a lime burner of 53, married to Catherine Black, and his parents were Hugh Cameron, teacher, deceased, and Sarah Colquhoun. The informant was his son, Hugh Cameron. The Old Parish Register for Kilmallie (Inverness) for 1783 recorded the birth of Ewen Cameron, son to Angus Cameron and Mary Cameron, Corvig, on 11 June. The Old Parish Register for Kilmallie (Inverness) recorded the marriage on 28 February 1811 of Ewen Cameron and Maria Colquhoun, at Inverscaddle. Information from the birth registrations of their children shows that Ewen and Maria lived in Ardgour, the southern part of the Kilmallie parish to the west of Loch Eil. Inverscaddle was at the mouth of Glenscaddle, north of the Corran Ferry, and Gerridh was to the south, on Linnhe Loch. Despite the notation in the Blenheim passenger list, it does not appear that they lived at Trislaig, which was at the northern end of Ardgour, opposite Fort William. Ewen Cameron was actually 57 when he sailed on the Blenheim. A record of Maria’s birth has not been confirmed. Ewen Cameron, sometimes known as Hugh Cameron, lived in Kaiwarra and worked as a tailor, as confirmed by Juror lists. A fatal accident occurred on Wednesday last to Mr. Ewen Cameron, who resided on the road to Kaiwarra. On his return home about eight o’clock in the evening, in walking too near the edge of the steep ravine or gulley in front of his house his foot unfortunately slipped, and he fell head foremost, and his head striking a projecting piece of rock he was killed on the spot. The body was discovered by his family the next morning lying in the ravine. An inquest was held on the body by Dr. Fitzgerald the Coroner, yesterday, when a verdict of Accidental Death was returned. The deceased was very much and deservedly respected as an honest man and an industrious settler, and had brought up a very numerous family with great credit and propriety. After Ewen’s death most of the younger members of the family appear to have moved to Auckland with their sister Jane and brother-in-law Alexander Alison, and where several of the daughters married mariners. In 1861 Sarah and Catherine went to the Otago goldfields with their husbands, apparently taking their aged mother with them, because Maria Cameron died at Blue Spur, Otago, on 28 December 1874. Blue Spur was in Tuapeka County, near Lawrence. The Tuapeka Times of 7 January 1874 carried the Death Notice: “Cameron – On the 28th December, at the residence of James Campbell, Blue Spur, Maria Cameron, relict of the late Ewen Cameron, of Kaiwarra, Wellington.” The death registration contains no information, other than the date of death, her name and age, 85, and cause of death, “old age”. The informant was the local undertaker. The Old Parish Register for Kilmallie (Argyll), records that Mary, daughter of Ewen Cameron and Peggy Colquhoun of Glenscaddle, was baptized on 24 January 1812. Mary Cameron was described as a chambermaid of 28 in the Blenheim passenger list. New Zealand BDM records show the marriage on 5 February 1841 of Mary Cameron and Peter McGrigor, barely six weeks after the arrival of the Blenheim. The New Zealand Colonist and Port Nicholson Advertiser of 16 August 1842 reported on a narrow escape from drowning, “Last Thursday, a boat laden with wood from Petoni, bound for Te Aro, with Charles Cameron, Peter M’Gregor, and a sailor; it was blowing very hard at the time and the boat being deeply laden, Cameron recommended M’Gregor not to leave, and if he did he might go by himself, as he (Cameron) would walk it, M’Gregor said he would chance it and left accordingly with the other boatman. They proceeded as far as Ngaurangi in safety, when a gust of wind upset the boat, and the men were thrown into the sea, the upper part of the cargo being washed away, the boat again righted, and the men got into her, although she was full of water, and were drifting out to sea all night, sometimes clinging to the outside of the boat, being frequently washed overboard. About nine o’clock the following morning, some natives rescued them from a watery grave, near Barrett’s reef, and brought them ashore more dead than alive. ” It is not known if the Charles Cameron referred to was Peter McGregor’s brother-in-law. Peter M’Gregor, Kai Warra, road, labourer, was on the list of prospective jurors for Port Nicholson in 1845. Mary McGregor, born in 1842. Little further information has been established for Peter McGregor or his daughter Mary. However, Margaret Perry, in her diary covering the period between 1865 and 1867, in talking about her Auntie (Marjory Cameron, see below), mentioned a Dan Richardson who had married a niece of Auntie’s and she had died. 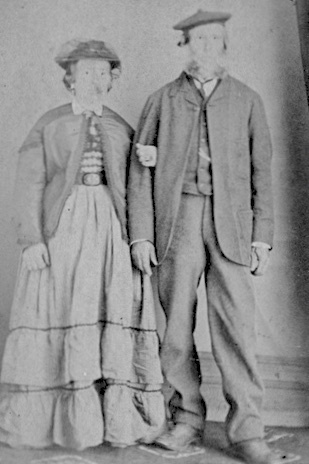 A Daniel Richardson married a Mary McGregor on 2 April 1861. A Mary Richardson died on 7 March 1865 aged 22. A child, Ellen Mary Richardson, daughter of Daniel and Mary Richardson, was born on 17 September 1864 and died on 18 January 1865, aged 4 months. In the Blenheim passenger list, Flora was described as a housemaid of 26, suggesting that her birth was probably in 1814. It seems from Electoral Roll records that the Simsons farmed at Turakina for a period, but by the time of their mother’s death in 1886 the sons had moved to Opunake, although their father was in Wanganui. Thomas Ritchie Simson died in 1907 aged 88, at Wanganui Hospital. The Wanganui Herald of 3 September 1907 carried the Death Notice: “Simson – At the Wanganui Hospital, on Sunday, 1st September, Thomas Simson, aged 88 years.”. Charles Simson, born in 1849. David Cameron Simson, born in 1851, died in 1901, married Elizabeth Putt in 1888. Marjory (Mysie) Cameron was described as a housemaid of 24 in the Blenheim passenger list., indicating she was born around 1816. John McQuarrie died on 10 December 1865. Mysie McQuarrie married George Perry on 14 February 1867. According to New Zealand BDM records, Marjory Perry died on 26 March 1903 aged 87. Her death registration indicates that she was a widow, and died at Devonport from heart failure and senility. Her parents were listed as Hugh Cameron, tailor, and her mother’s maiden surname was Colquhoun. Marjory was born in Argyleshire and had been in New Zealand for 63 years. She was married first in Wellington to Hugh [sic] McQuarrie when she was 22, and secondly in Turakina to George Perry. There were no living children. The informant was W H Burgess, authorised agent. William Henry Burgess was Marjory’s brother-in-law, the widower of her sister Margaret. Jane Cameron was listed as a housemaid of 22 when she travelled on the Blenheim in 1840. Alexander Alison was a ship’s carpenter who came to Nelson in the early 1840s. The family moved to Auckland in 1848, settling in Devonport in 1854, where Alexander continued his trade as a boat-builder. DEATH OF MR. A. ALISON, SEN. It is with much regret we have to announce the decease of another of the old identities of Auckland, in the person of Mr. Alexander Alison, sen., who has been ailing for some weeks past, and who died peacefully at his residence, Devonport, yesterday morning, at half-past eleven, at the advanced age of 7S years. The deceased gentleman, who was a native of Inverness, Scotland, arrived at Nelson some fifty years ago, but shortly afterwards chose Auckland as his place of residence, and has lived at Devonport over thirty years. The deceased was a man of sterling qualities, of a warm-hearted and genial disposition, and highly respected by a wide circle of friends. He leaves a widow and three sons, each of whom are grown up and married, and hold prominent positions, to mourn his loss. The funeral is announced to take place at Devonport to-morrow (Tuesday), at three o’clock. Alexander Alison, born in 1846, died in 1923, married Annie Stokoe in 1868. Roderick Alison, born in 1850, died in 1882. Ewen William Alison, born in 1852, died in 1945, married Mary Ann Coleman in 1876. Duncan Donald Tobias Alison, born in 1856, died in 1935, married Emma Lyons in 1884. The New Zealand Dictionary of Biography has an entry for Ewen William Alison, noting that he was born in Auckland on leap day, 29 February 1852, the son of Jane Cameron and her husband Alexander Alison, a shipwright. At the age of 15 Ewen went off to look for gold in the Thames goldrush, and made sufficient money to join his brother in a butchery partnership in Devonport. He went on to become a businessman involved in shipping and property, and was active in local and national government. Ewen married Mary Ann Coleman on 26 July 1876, and they were to have four sons and two daughters. His main claim to fame was to found and develop the Devonport Steam Ferry Company Limited, with his brother Alexander. Ewen Alison died on 6 June 1945 at the age of 93. The Old Parish Register for Kilmallie (Argyll) for 1822, records the baptism of Charles McLean Cameron son to Ewen Cameron and Margaret Colquhoun in Gearidh on 28 July, born on 20th Curr. [of the current month]. In the Blenheim passenger list Charles McLean Cameron was described as a labourer of 18. Your letter of the 24 June I recd about a fortnight ago. I was delighted to hear from you and so was all your old friends and acquaintances about Turakino. We all thought that you had your departure taken to the other world long ago, never hearing from you. We are all much pleased to think that we were wrong, and that there is a chance of seeing you again. Well – in reply to your queries. Your sister that was married to John McQuarie is married again to a man named Perry and I believe is very comfortable I haven’t seen her for a long time. Hitherto they have been living at Turakino but I was told a few days ago that they had shifted down to near Rangatikei on the road to Bulls – I was told that he had taken a small farm there. Mrs Perry – near Bulls – Rangatikei – Wellington – N.Z. I think will find her – of your brother Donald I know nothing or next to nothing – I was asking Charlie Cameron a few days ago if he could tell me anything about him. He says that at one time he heard that he left Hokitika and went to Tauranga but that he heard afterwards that he went back again to Hokitika – that was all he could tell me about him. Of your cousins Donald Bane’s family there are only three of them alive Mrs Grant, Mrs McDonald and Mrs Brabason, all the sons are dead. The Grants have a very nice place at Turakino and are thoroughly independent, Alec McDonald and his family have a fine place on the Oroua Stream about halfway between the Rangitikei and Manawatu Rivers. This is all I know about your relations, of your other fellow passengers on the Blenheim there are several of them still in Turakino – Old John Cameron and wife only died last year within a few weeks of each other. I believe the old man was quite 100 years old – his eldest son John was killed by a tree falling on him when he was felling – Charlie and Archi have both got fine places in Turakino with large grown up famileis and thoroughly independent. If you ever come to see us again you will find the country very much altered. We have a fine bridge across the Wanganui river opposite the centre of the Town. And a railway opening from Manawatu to Patea and will soon be open all the way to Waitara on the north side of New Plymouth. There is also a railway in course of being formed from Wellington to the Manawatu to join on to the New Plymouth railway, and there is a line to be taken somewhere from the West Coast right up through Taupo into the Waikato to join on to the Auckland railway. Altogehter the country is going ahead notwithstanding the very slack times that Farmers are having and all those public works going ahead make it all the wose for the poor Farmers for it helps to keep the price of labour up sa high as ever. Sheep and cattle are lower now than they have been for many years and the wool market is exceedingly low the lat sales were the lowest we have had for years notwithstanding which land keeps up its price – It is not unusual to hear of properties changing hands at from £10 to £20 an acre. We are looking forward to be able to get ris of our surplus beef and mutton by this freezing process several cargoes have been sent home with great success – some sent from Dunedin was sold in London as English Down mutton. Native difficulty I think is settled now I dont think there is much dange of any more disturbances of any consequence. We are geting too strong for them our volunteer and militia corps are well trained and well armed and amount in the agregate to several thousands and the Maories know it and are afraid of them. They are also wide awake enough to see that in all the wars they have had with Europeans that tho thye may occasionally have a success in the long run they have always the worst of it – they are beginning to find out there is more to be gained by legislating than fighting. Write me on receipt of this and let me know if there is any chance of your coming back to New Zealand, and as you say that tou are still a Batchelor you might be able to pick up a buxom hussey that would keep you comfortable in your old age. It is not clear when Charles McLean Cameron returned to New Zealand. The 1905-1906 Electoral Roll for Eden in Auckland, records Charles McLean Cameron, inmate, at Costley Home. The Costley Home for the Aged Poor, was originally located within the Auckland Hospital grounds, but in 1890 moved to Epsom. New Zealand BDM records have the death of a Charles McLean Cameron on 1 April 1909, aged 87. Sarah Cameron was 16 when she sailed on the Blenheim with her family. Duncan Campbell was born in Perthshire, Scotland and was a half-brother of James Campbell who married Sarah’s sister Catherine Cameron. It is not clear when he came to New Zealand. In the early 1850s Duncan Campbell was the skipper of the Benlomond, a 35 ton schooner in the coastal trade. According to Electoral Roll records the family was living at Nelson Street, Auckland, in 1856. It appears that the family moved to Gabriel’s Gully, Otago in 1861. 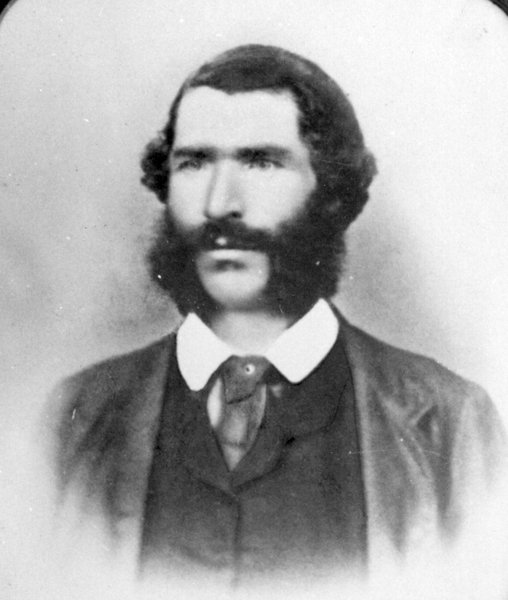 In 1872 Duncan Campbell was appointed to be teacher at the Tuapeka Mouth School. An inspector’s report noted that he was untrained and only on trial, and it was doubtful if he would succeed as a teacher. He then took up farming in the district. MYSTERIOUS DISAPPEARANCE OF A SETTLER. We learn that Mr. Duncan Campbell, settler at Tuapeka Mouth, has disappeared in rather a mysterious manner. It appears that on Sunday evening Mr. Campbell crossed a man from the west side of the river to Dalhousie, and remained with the boat whilst the passenger went up to the township, promising to return in a few minutes. The man was longer than he anticipated, and on his return to the river bank was surprised at not to find either the boat or Mr. Campbell who has not yet been seen or heard of. Search was made by the residents of Dalhouse without avail, and up to the hour of our going to press, neither Campbell nor the boat had been heard of. Mr. A. M’Beath gave information to the police last evening, and they started away to assist in the search. The missing-man was an old resident in the district having come from the North Island about the first the Gabriels Gully rush. He followed digging for sometime, and subsequently became a mining agent in Lawrence. Being a man of good education, and possessing a fair share of natural talent, he was subsequently appointed Schoolmaster at Tuapeka Mouth, a situation which he resigned only a few months ago, when he took to farming, following it up to the time of bis disappearance. He was well known throughout the district; his obliging disposition and genial character rendering him generally well liked in the place. A correspondent writes: Not a few in and about the district of Gabriels will read with feelings of melancholy interest the circumstances attending the sad end of poor old Duncan Campbell. He was in many respects of the word a coupling link between New Zealand of the past and New Zealand of the present. The date of his advent in this colony is somewhat obscure, but it is understood he got here about the latter part of the decade ending ’30 or beginning of ’40. When I say here, I mean Auckland, as you must be aware the southern provinces were little known of in those primitive days. The last time I saw him was only a few weeks ago, and he then presented all the animated appearance of a hale hearty old man who had yet many days to live. Nothing delighted him better than to recall the old times and early associations, when British rule was to a great extent subservient to Maori custom. On the occasion to which I allude he was in company with another of the old New Zealand School a resident about Tokomairiro. To hear these two old “fogies” recite their early adventures in the Northern territory was a perfect treat. The name and surname of a leading minister of the Colonial Cabinet was mixed up with one of their exploits the burden of the narrative being that they had only one blue blanket amongst the three of them, and that thus gaudily attired they set out to pay court to a tatooed damsel, possessed of great personal attractions. The conclusions indulged in by these two worthies in drawing parallels between the third occupant of the blue blanket engaged upon this escapade, and his present occupation as leader of the House of Representatives, were whimsical in the extreme. With their recollection still fresh upon my memory the intelligence of his sad end comes home to me with all the force and effect of one of those rude shocks which teaches us too truly that in the midst of life we arc in death. Our Lawrence correspondent inform us by telegraph that the body of Duncan Campbell was found on the bank of the river at the mouth of a small! creek 13 miles below Tuapeka Mouth by Mr John Tyson some days ago. The body was brought up to Tuapeka Mouth, an inquest was held by the Coroner, and a verdict returned, ”Found Drowned.” A large number of friends followed the remains to the Lawrence Cemetery. Margaret Campbell, born in 1852, died in 1917, married John Glass in 1871. Maria Campbell, born in 1854, died in 1947, married Andrew McBeath in 1875. Donald Campbell, born in 1855. Duncan Campbell, born in 1857, died in 1938, married Mary McFadzien in 1885. Euphemia Campbell, born in 1859, died in 1942, married George Anderson Laidlaw in 1879. Sarah Campbell, born in 1862, died in 1862. Mary Campbell, born in 1863, died in 1944, married William Rainsford Bennett in 1884. The Old Parish Register for Kilmallie (Inverness) for baptisms from Corran in 1826, recorded the baptism on 3 September of Allan, son of Ewen Cameron and Maria Colquhoun in Girah, Ardgour, born on the 22nd of August. On the passenger list for the Blenheim in 1840, Allan was described as a cowherd of 14. The reference in Early Wellington to the death in 1846 of a son of Mr Hugh Cameron, who died of consumption, aged 21, which is confirmed by Bolton St Cemetery records, is not this Allan Cameron. Advertisements in Wellington newspapers in 1850 show that “A D C Cameron” was taking over the Kaiwarra Brewery from his brother Charles. Bolton St Cemetery records include a reference to “A I C Cameron”, but no further information has been established for Allan Cameron. The Old Parish Register for Kilmallie (Argyll) in listing baptisms from Corran and Balacolish, recorded that Donald, son of Ewen Cameron and Maria Colquhoun in Ginah, was born on the 25th of December 1828 and baptised on 4 January 1829. Donald Cameron was a cowherd of 12 in the Blenheim passenger list. No further information has been established for Donald Cameron, apart from a suggestion that he may have gone to the Victorian goldfields. The Old Parish Register for Ballachulish and Corran of Ardgour recorded that Margaret, daughter of Ewen Cameron and Margaret Colqhuhon, Gearradh, was born 1st April 1831, and baptised on 24 April 1831. Margaret Cameron was 9 when she travelled on the Blenheim with her family. New Zealand BDM records show that Margaret Cameron married William Henry Burgess on 26 March 1862. William Henry Burgess was the son of James William Burgess and Elizabeth Blackburn, and was born in London on 14 March 1834. He became a mariner, like his brother Isaac Burgess, who was the Auckland Harbourmaster for many years, and also lived on the North Shore. Electoral Rolls for 1870-1876 show that William Henry Burgess lived at North Head, on Auckland’s North Shore, and from 1880 at Devonport, when his occupation was given as pilot, and mariner from 1890 to 1906. Captain William Henry Burgess, brother of the late Captain Isaac Burgess, for many years harbourmaster at Auckland, died at Devonport on Friday, in his 78th year. Born in Limehouse, London, in 1834 deceased, like his forefathers, took to the sea, and shipped as boy on the ship City of Poonah, bound for India. On his return he joined the barque Lord William Bentinck, which arrived in Auckland with troops on board on August 26, 1850. After serving in various capacities in the brigs Invincible and Kestrel, the steamer William Denny, and the brigantine Despatch, he entered the pilot service in 1858, remaining there until 1884 – a service of 26 years. Many of the early arrivals will remember Captain Burgess as being the first person they met in the new land, when he came aboard to pilot them in. After leaving the pilot service he served on the coast in the steamer Waitaki, and then in the Devonport lorry service. Retiring on account of ill-health he lived quietly at his home at Devonport. Captain Burgess passed through all the hardships of the early seafaring days, from ship’s boy to the holder of a deep sea ticket. At Parnell, in 1862, he was married to Margaret Cameron, of Argylshire, Scotland, by the Rev. Dr. Bruce. He leaves two sons, four daughters, and nine grandchildren. Alice Maria Burgess, born in 1863, died in 1954, married Charles Frederick Taine in 1895. Clara Margaret Burgess, born in 1865, died in 1950, married Henry Dugald McKellar in 1890. William Isaac Burgess, born in 1866, died in 1869. Flora Cameron Burgess, born in 1868, died in 1945 (Australia), married George William Phillips in 1905. James William Burgess, born in 1870, died in 1952, married Bertha Lucie Barlow in 1904. Maud Jane Burgess, born in 1871. Herbert Donald Burgess, born in 1876, died in 1966. The Old Parish Register for Ballachulish and Corran of Ardgour recorded that Ann, daughter of Ewen Cameron and Margaret Colqhuhoun, Gearrigh, was born on 8th April 1833, and baptised on 15 April 1833. The Blenheim passenger list recorded Anne as 7 years old in 1840. Annie Cameron, married Donald McLeod McKinnon in Sydney, New South Wales, Australia, on 23 January 1853. Donald McKinnon was born on the Isle of Skye, the son of Malcolm McKinnon and Euphemia McLeod. The family emigrated to Australia on the Midlothian in 1837, and settled in the Maitland area of New South Wales. Donald went to school for a while before leaving to go to sea, working in the whaling industry off New Zealand, and presumably met Ann in Auckland, possibly through her brother-in-law Duncan Campbell. Ann McKinnon died on 21 June 1881 at Wingham, NSW, aged 45. Death.- On Tuesday morning, at his residence, Glen Ora, Clarksons Crossing, after a somewhat protracted illness, died Mr. Donald M’Leod M’Kinnon, at the age of 67 years. The deceased gentleman was a native of the Isle of Skye, Scotland, and had resided on the Manning from about 1856 until 1862, when he removed to the Walambra district, where he lived up to the time of his death. His wife has been dead for several years, but four sons and daughters, all grown up, are left to mourn their loss. The departed gentleman was the father of Mr. Hugh M’Kinnon, commission agent, of Sydney, and was well known and much esteemed and respected. The funeral, which was very largely attended, took place in the Taree Estate Cemetery, when the Rev. S. P. Stewart officiated at the grave. Malcolm McKinnon, born in 1853, died in 1908, married Catherine Emily Brewer in 1887. Hugh McKinnon, born in 1855, died in 1930. Donald McLeod McKinnon, born in 1857, died in 1922, married Sarah Jane Cox in 1884. Euphemia McKinnon, born in 1859, died in 1915, married Thomas Richard McCartney in 1883. Charles William McKinnon, born in 1861, died in 1940, married Catherine Taylor in 1923. John McKinnon, born in 1863, died in 1863. Maria Flora McKinnon, born in 1864, died in 1935. Ann McKinnon, born in 1867, died in 1952, married Henry Miles in 1902. Harriet Frances McKinnon, born in 1870, died in 1948. Mary Jane McKinnon, born in 1873, died in 1948. Catherine Mary McKinnon, born in 1879, died in 1962, married Eric Hugh Stuart McMaster in 1911. Catherine Cameron was 4 years old when she sailed to New Zealand on the Blenheim. James Campbell was born in 1835 in Grandtuly, Perthshire, and was a half-brother to Duncan Campbell, who married Catherine’s sister Sarah. The family was living in Whangaparoa, Auckland, and James was described as a farmer, when the first three children were born. They then moved to Gabriel’s Gully in Otago, and James Campbell was described as a miner in the birth registrations of his children. 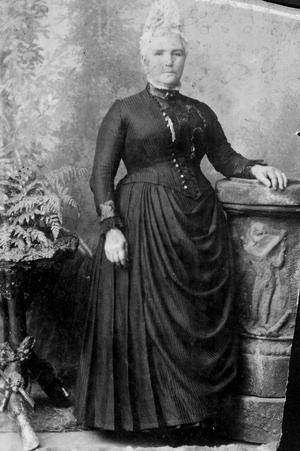 Catherine Campbell died on 23 February 1898 at Gabriel’s Gully, Tuapeka, Otago. James Campbell died on 22 October 1898 at Blue Spur, Otago, through the accidental discharge of a gun. James Campbell, born in 1857, died in 1882. Charles Campbell, born in 1858, died in 1941, married Isobel Patterson Cousins in 1884. Alexander Campbell, born in 1862, died in 1922, married Emma Ida Daniel in 1891. Margaret Campbell, born in 1865, died in 1934, married Samuel Edward Portman Vernon in 1907. Catherine Campbell, born in 1866, died in 1946, married Andrew Barr in 1903. Archibald Campbell, born in 1868, died in 1869. Anne Campbell, born in 1870 (twin), died in 1943, married John McDonald in 1903. Jane Campbell, born in 1870 (twin), died in 1923, married Andrew McGregor in 1900. Maria Campbell, born in 1873, died in 1950, married Albert Swanwick in 1897. Sarah Campbell, born in 1875, died in 1955, married Robert Henry Ledlie in 1898. Isabella Campbell, born in 1877, died in 1882. John Cameron Letters – Letters of John Cameron of Callart, “Marangai”, Wanganui, New Zealand, 1854-1892, transcribed by the Alexander Turnbull Library, May 1952, from originals made available by Dr Elspeth Fitzgerald of Oamaru, edited by Ann Newman. Te Ara – New Zealand Dictionary of Biography.